Multi-dog discount applies when dogs from same household share same overnight villa. We have compared our services, our facility and our rates with other professional pet care providers in Mesa, Gilbert, and Chandler. Below are our comparison findings. Live webcams, large inside/outside connected play yards, and overnight potty break for boarding guests. We are the only facility in Phoenix to provide all of these. We have three inside/outside connected play yards with a fourth indoor yard. Boarding is all-inclusive. All-day daycare for boarding dogs includes 390-minutes Monday-Saturday and 290-minutes Sundays and Holidays. Daycare dogs have inside/outside access all day between 6am – 6:30pm, except during lunch and during dinner when our outside turf is being cleaned. We do not charge extra for medications. We believe flea/tick meds are poison and therefore do not make flea/tick applications mandatory. We do expect all dogs to be flea and tick free. We are open every day, 365 days a year, including holidays and Sundays for you to pick up or drop off overnight boarding dogs. We have a water softener and 2 Reverse Osmosis stations. R.O. water is provided to all our overnight boarding guests. Live webcams are rare. Inside/outside yards are rare. Overnight potty breaks are not an option except at one place for an extra $5.00. Other facilities are either indoors only or outdoors only and have only two yards to separate sizes. A couple places have an inside play area with very small 10 ’x 10’ connected outside area. 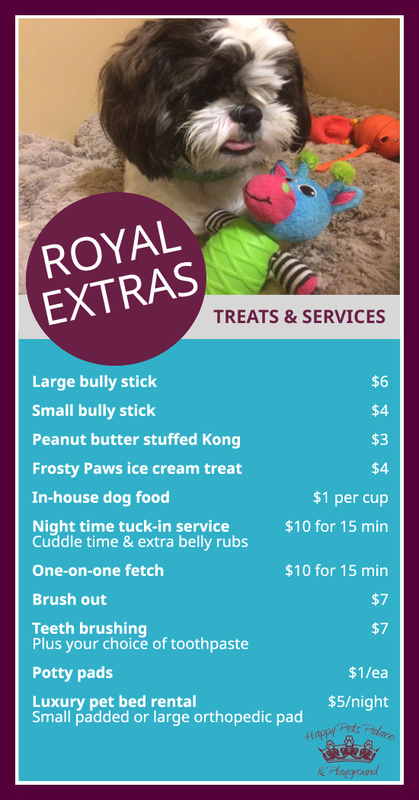 Most facilities are ala-carte, give a couple brief play/potty sessions and charge extra for additional play/potty times. Other facilities crate dogs in afternoons because daycare ends around 2pm or 3pm. Other places charge $1 - $5 per application. Several facilities charge $10-$15 for required flea-tick application upon entering. Most facilities are closed major holidays and some are closed Sundays too. If you are traveling Sunday or Holiday, then you have to board one day more than necessary. Most facilities serve municipal city water with no water softener or filtration available. Lots of love and playtime! All employees are trained in pet first aid and CPR, as well as reading dog body language and knowing what is good play and how to redirect dogs when needed. We are in this business because we love dogs and we care about their well-being. We hope you recognize how we go above and beyond in what we offer, the quality of our services, and our amazing inside/outside facility. Multi-dog discount shown above in the pricing table only applies when dogs from the same family sleep in the same villa. 5% discount for extended stays, 11 consecutive nights or more on overnight boarding rate. Cannot be combined with any other discounts. Check out time is 10:30 am on Sundays & holidays or 12 noon Monday – Saturday. The afternoon checkout charge of $20 applies if you pick up your dog after 10:30 am Sundays or holidays or 12 pm Monday – Saturday. We do charge a $20 convenience charge to have our lobby open for pick-up or drop off on six major holidays versus being closed. New Year’s Day, Memorial Day, July 4th, Labor Day, Thanksgiving Day, Christmas Day. Holiday hours apply 8:00 am – 10:30 am or 4:00 pm to 6:30 pm. Bring your own food for your dogs. This keeps your dog’s diet consistent during their stay. High energy dogs burn more calories in dog-dog group play so bringing a little bit of extra food for each meal would be beneficial. Also, consider packing an extra day’s worth of food and/or medication just in case your travel plans get delayed. All dogs coming for boarding or daycare must pass our pre-screening evaluation to make sure they are non-aggressive and appropriate for dog-dog group play. 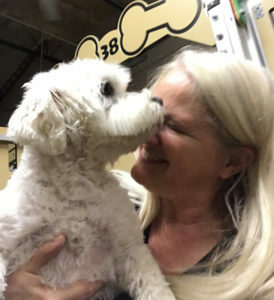 Call us today at 480-207-1852 to set an appointment for your dog’s pre-screening evaluation so your dog can come make new friends at doggy daycare. Daycare rates apply. All dogs must be current on rabies and distemper. All dogs must be neutered/spayed once they are of age. Males by 7-8 months and females by 10-12 months. Military receive 10% discount on daycare and boarding. Cancellation Policy – We require cancellation notification of a boarding reservation at least 48 hours prior to the first-day boarding stay. An amount equal to one night’s stay will be charged if notification is not received within this time frame. We accept Cash, Check, Visa, American Express, Master Card & Discover. A NSF charge of $25 applies to any returned checks / bounced checks. 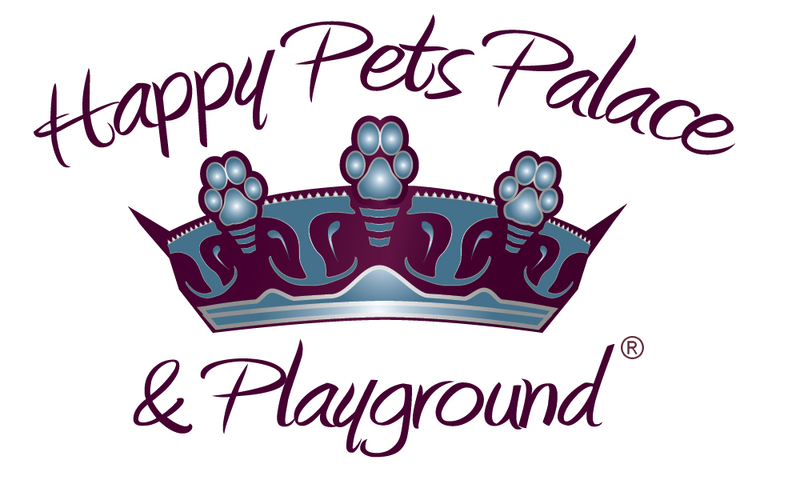 Watch the virtual photo tour of Happy Pets Palace here! Watch our live video tour here!